Original Mughal Garden Plan didn't include an Iron gate. Stupidly enough, nobody thought of it at that time. And these Royals were supposed to be master builders of gardens. The iron gate stands right over the stream making exit from the garden. Queued. As Master and Madam confer. Children are all ear. Almost all of them. We are in. It's a Picnic. Watch me make a splash! Don't wet my shoes! The kid just put his face right in front of my face, smiled and went, ''Asalawalekum!' The right thing to say is - Walaykumsalam. As stood on the ancient terrace, a little girl walked unto the place where I stood, confident, she went, 'Execuseme!'. I realized I was blocking the entry to the monument. The right thing to do is - walk aside. The humble-almost embarrassed - source of all water in the great garden. Alternate entry point. No entry fee. And it is fun. 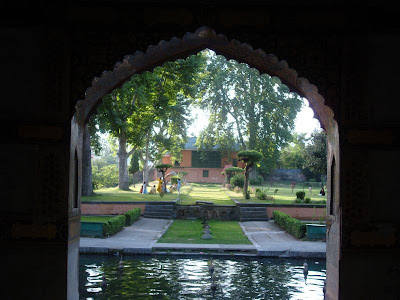 Again, stupidly enough, it was not included in the original garden plan by the great Mughals.